A few months ago there was an article in New Scientist about Google’s research paper on potentially ranking sites based on how factual their content is. The idea is generally and genuinely absurd. You can’t copyright facts, which means that if this were a primary ranking signal & people focused on it then they would be optimizing their site to be scraped-n-displaced into the knowledge graph. Some people may sugar coat the knowledge graph and rich answers as opportunity, but it is Google outsourcing the cost of editorial labor while reaping the rewards. In some areas (especially religion and politics) certain facts are verboten & people prefer things which provide confirmation bias of their pre-existing beliefs. End user usage data creates a “relevancy” signal out of comfortable false facts and personalization reinforces it. In some areas well known “facts” are sponsored falsehoods. In other areas some things slip through the cracks. In some areas “facts” are backward looking views of the market which are framed, distorted & intentionally incomplete. There was a significant gap between internal voices and external messaging in the run up to the recent financial crisis. Even large & generally trustworthy organizations have some serious skeletons in their closets. For a search engine to be driven primarily by group think (see unity100’s posts here) is the death of diversity. Those “data” and altruism claims from Google recently fell flat on their face when the Wall Street Journal published a number of articles about a leaked FTC document. Part of the reason the data set was incomplete on that front was for the most part only larger ecosystem players were consulted. Google engineers have went on record stating they aim to break people’s spirits in a game of psychological warfare. If that doesn’t hinder consumer choice, what does? When the EU published their statement of objections Google’s response showed charts with the growth of Amazon and eBay as proof of a healthy ecosystem. The other obvious “untruth” hidden in the above Google chart is there is no way product searches on Google.com are included in Google’s aggregate metrics. They are only counting some subset of them which click through a second vertical ad type while ignoring Google’s broader impact via the combination of PLAs along with text-based AdWords ads and the knowledge graph, or even the recently rolled out rich product answer results. 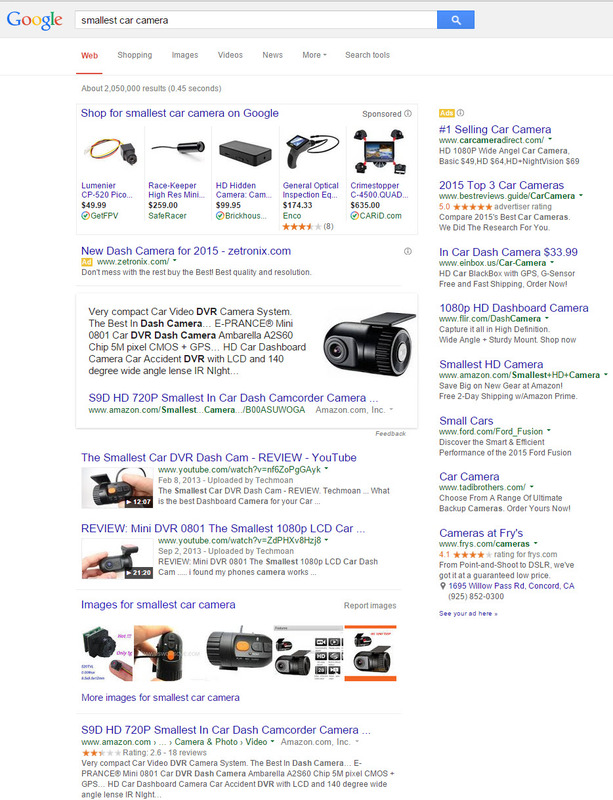 Google has allegedly spent the last couple years removing “visual clutter” from the search results & yet they manage to product SERPs looking like that – so long as the eye candy leads to clicks monetized directly by Google or other Google hosted pages. About 3 years ago I wrote a blog post about how branding plays into SEO & why it might peak. As much as I have been accused of having a cynical view, the biggest problem with my post was it was naively optimistic. I presumed Google’s consolidation of markets would end up leading Google to alter their ranking approach when they were unable to overcome the established consensus bias which was subsidizing their competitors. The problem with my presumption is Google’s reliance on “data” was a chimera. When convenient (and profitable) data is discarded on an as need basis. While Google was outright stealing third party content and putting it front & center on core keyword searches, they had to use “about 100 “synthetic queries”—queries that you would never expect a user to type” to smear Bing & even numerous of these queries did not show the alleged signal. Google’s justification for not being transparent is “spammer” would take advantage of transparency to put inferior results front and center – the exact same thing Google does when it benefits the bottom line! Eventually that subsidy would be a problem to Google if the algorithm was the only thing that matters, however if the entire result set itself can be displaced then that subsidy doesn’t really matter, as it can be retracted overnight.